[Trend] How Can Gugak Approach a Global Audience? I was approached by KAMS to write an article on ’The Future of Gugak on the World Stage.’ Questions to be answered are: How can gugak approach a global audience? And what should we keep and what should we try? Of course I feel much honored to write an article about this subject. But it is a little bit scary too. 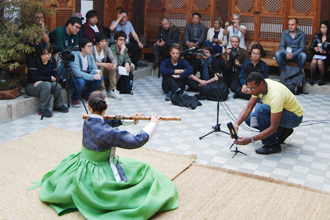 Although I’m already working for more than 20 years in the ’world music business’, and I have been presenting Korean traditional music in The Netherlands for quite some years, I would like to stress that the views presented in this article are strictly my opinion. It’s definitely not a ’recipe’ or ’a solution’. First of all, please let me stress that KAMS is already doing a very good job in supporting gugak. Since approximately seven years more and more Korean ensembles are to be seen in festivals and in venues all over Europe. Quite a different situation from ten years ago, when hardly any Korean music was presented on the world stages. Let’s start at the beginning, the content. To speak from an European point of view, gugak is not easy listening music. Whether it is religious music, court music or folk and shamanistic music, a lot of it sounds quite alien to western ears, like the high pitched and piercing sounds of the piri and taepyoungso, the noisy cymbals and kkwaenggwari, the very slow rhythms, and the emphasis on huge vibrato. It might be traditional music for the Koreans, but it is avant-garde music for most westerners. So the audience outside Korea needs to get acquainted with it. Gugak needs a different way of listening. It’s an acquired taste. There is certainly an audience for gugak outside Korea, but clearly it will never be a huge audience. Of course within gugak some genres are more accessible, like pungmul and samulnori. But does this mean KAMS should only support the more accessible genres? Or those Korean artists should play more ’westernized’ music in order to approach a global audience? No, not at all. To the contrary I should say. To start with the latter question, I have been asked several times by Korean artists “what music should we play”. Well, that’s not the right approach. Good music comes from the heart, from the soul. Keep close to what you like best. Don’t change your style in order to please other audiences, it won’t work. To speak for myself, I’m not coming to Korea to see and hear western style music. There’s plenty of that where I come from. And often it is better, and certainly cheaper to put on stage. So as a Korean artist, please take that into account. If you want to play western or westernized music in order to go global, you have to compete with half of the world. It’s not impossible, but you must be very very good and very distinctive to pull that off. So why not stick to your guns, stick to gugak. Nobody outside Korea plays it, so it’s already very distinctive. That’s a big plus. Think of the complex rhythms, the deep vibratos, and the silence between the notes in genres like sanjo, sinawi and court music. These are elements to work with. Not western harmonies. These only dilute the Korean music and, to my opinion, most of the times make it less interesting. I think people in the West like to see and hear something different, that’s what gugak can bring. Especially in these hectic modern times, the slow rhythms and build-up in sanjo and court music are a welcome change, for some people at least. There might be a future for ’slow music’, like there is a movement in the West for slow food. This directly answers the first question too. The way KAMS is working now is fine, supporting both more and less accessible genres. But it’s not only about the content. It’s also about the market. In order to reach out to a global audience I think there are different markets to approach. Talking from a world music perspective, first of all you have the outdoor festivals. As I mentioned before, a lot of Korean groups tour these festivals nowadays, especially pungmul and samulnori groups. In this way they reach out to a lot of people. However, I have the feeling that (outdoor) festival audience isn’t very ’loyal’. Although they might have enjoyed the performance, they are not easily convinced buying a ticket for a separate gugak performance in a venue. Secondly you have the venues who present Korean music. However, apart from some specialized world music venues there are not many halls that present gugak regularly (approximately three to four times a year), because it doesn’t attract big audiences. The audience that comes however is quite a loyal audience, an audience of music lovers. Anyhow, on gugak concerts venues almost always lose money. So more and more the tendency is to present gugak as part of a bigger indoor festival. Which means to stage gugak regularly in the future more audience is needed. There’s where western promoters and agencies and Korean musicians, managers and institutions need to help each other. How? Well, let’s start looking at Hindustani classical music from India, one of the first non-western music styles to become big in the West (although its popularity has become much less now). This music is also ’difficult’ music. Music for acquired taste. Because sitar player Ravi Shankar performed at a western pop & rock festival where all the big western names were performing, and because bands from the west like The Beatles and The Rolling Stones started incorporating sitars in their music, this raga music suddenly reached out to a global audience. Of course these were different times; times of love and peace, and the Indian philosophy (think of the entire guru’s who toured Europe and USA) also played its part. I’m not sure there’s the same over all sensibility towards new sounds like gugak in the West in modern times, and I really now can’t think of any famous groups or composers that would incorporate geomungos, haegums or ajaengs in their music and make gugak fashionable worldwide in five years time...but who knows? We can certainly start somewhat more modest. First of all in Europe hardly anyone knows about gugak. It’s never to be seen on national television, hardly to be heard on national radio, and it’s not even available in record shops (apart from a single specialized one). So you need a network of journalists who are really into gugak, preferably journalists (radio, TV, internet, magazines and newspapers) working for the national channels so that it reaches out to as many people as possible. These are your ’media ambassadors’. Apart from that it is important that the music is available and accessible for an international audience. So you might not only look for distributors, but you also have to make sure the released music has got texts and translations in English too. Media need input, so it would be a big help if Korean people, especially artists and managers, (dare to) speak English too. You really don’t need to be ashamed if you don’t speak it perfectly. Nobody does, apart from the native speakers maybe. To reach out globally collaboration and international exchange projects could be good tools, for instance the pansori-flamenco project I just saw during my visit to Korea. Through these kinds of projects gugak could be presented in completely different venues and different festivals. In this way gugak reaches out to different markets, and people get acquainted with the instruments and sound of gugak. However, quality is always the main criteria, so apart from involving a very good pansori group, you should involve a flamenco group of at least the same level as well. This of course also applies to other kind of collaborations and international exchange projects that work on a smaller scale. But always watch out not diluting the gugak too much. And if collaboration doesn’t work out as expected, and then just stop. Don’t present something that musically isn’t good enough. Besides that you need a durable network of reliable agencies and enthusiastic promoters that stage gugak regularly. Like the ’media ambassadors’ these are ambassadors too. Talking about Europe you of course already know about and work with the world music festival network EFWMF, but there are also several other networks as well like a European Jazz Network and some national and regional venue networks. At this moment a new network is being set up, an European network of world music venues, called Lemon. I’m sure there are networks like these in the USA too and maybe in Asia itself. If not, it might be wise help establishing such a network in Asia because it’s a growing market. At the moment there’s more money in Asia than in Europe and USA, and also interest in ’world music’ is getting bigger in Asia. These promoters and agents could also function as links to bigger (pop en rock) festivals, or to other kinds of festivals and venues, so to reach out to different audiences and different markets. I can see gugak being part of a contemporary music festival, a jazz-improvisation festival, a minimal music festival or even of certain underground festivals, all with completely different audiences. From the Korean side maybe more could be done to involve the Korean embassies in the different countries, for instance in reaching out to the Korean community. And maybe big companies like Samsung, LG, Hyundai and Kia could act as ambassadors for gugak too. Other countries like for instance Taiwan, have established offices in Europe (the Cultural Centre of Taiwan in Paris) to reach out more globally. Other examples are of course the Goethe Institut (Germany) and Institute Français (France).This could be a point of consideration, although I’m afraid the costs of running an office outweigh the potential benefits. So to wrap things up. Regarding content, please keep your music as distinctive as possible, which means not westernizing gugak. Stay focused on high quality music. It will pay off in the end. Furthermore keep on establishing a durable and reliable network per country or region, not only with promoters and agencies, but also with journalists/media and record distributors. Use them as ambassadors for gugak and, via them, focus on other music scenes and markets too. Keep developing high quality international exchange projects, but make sure the distinctive Korean flavor is kept alive. And try to involve Korean embassies and Korean companies more in reaching out to a global audience. It will take some time, but I’m sure there is still a world to be won for gugak. Francis de Souza has been working in the world music business since 1992. May 1st 2013. He became program coordinator at RASA, a world music venue in Utrecht from 1999-2013. He have worked as music programmer and festival organizer in Tropentheater (part of Royal Tropical Institute or KIT), Amsterdam (Netherlands). Also, he is artistic director of the Houtfestival, an open air festival in Haarlem (NL), dedicated to world music and other adventurous music.